I can't believe I actually held off purchasing the original Japanese art book when it came out in August 2008. The long wait for the translated version from Viz Media is finally over! It's cool that they have also used the smooth matte paperback covers typically used by the Japanese Studio Ghibli art books. Nice touch. The Art of Ponyo on the Cliff by the Sea is a very beautiful book presented just like the other Studio Ghibli art books. There are background paintings, pencil watercolour sketches and film stills. This time, they have included more concept art than the film stills. We have lots of character designs and town paintings. That's over 220 pages of art work followed by the complete voice-over script. All the concept sketches are drawn by Hayao Miyazaki in his usual pencil and watercolour wash treatment. The concept art and backgrounds by the art staff were supervised by art director Noboru Yoshida, and character sketches and design are by supervising animator Katsuya Kondo. There are interviews with those two as well as with Michiyo Yasuda (Chief Colour Designer) and Atsushi Okui (Director of Digital Imaging). They talk about the watercolour storyboards, how Miyazaki works, how they create the sea and other production stories. This book is highly recommended for all fans of Studio Ghibli. It will put a smile on your face. Hello. First of all, wanna tell, that your reviews are great and very usefull, thanks. And I have one question. is this book hardcover or softcover? Cause everywhere it's marked as a softcover, but on your photos it looks more hardcover-y. And in case, if you know: is Viz going to release a hardcover version? Softcover edition is a strange choice after other books in this series. And are they going to translate other Ghibli artbooks? Come to think of it, I've actually forgotten that the previous Ghibli books from Viz are actually all hardcovers. I don't know if there's going to be a hardcover version or if they are going to translate the older Ghibli artbooks. This edition is very incredible! 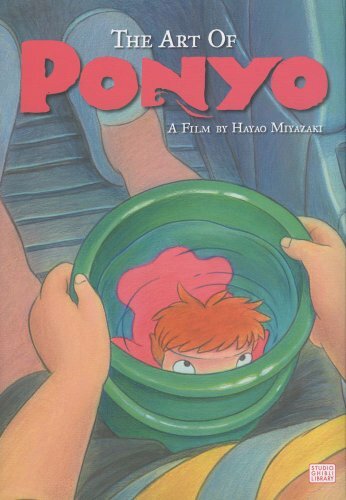 I currently own Ponyo on Blu-ray, and will soon own Arrietty on Blu-ray, and thought these books would be really nice to accompany them. When Howl's Moving Castle and Spirited Away come out on Blu-ray, I will also add those movies' books to my collection. Studio Ghibli movies are very much an art form, so if you're a fan of the movie, the books will elaborate on your Studio Ghibli film collection. I do agree that the hard cover versions feel much more solid, but these softcovers look like great books too. You have a great website, and your reviews were just what I needed to get a little more information and screenshots regarding these art books. I found you through your Amazon review, and liked the video you posted of you flipping through the book.